Forecast: As this is written, it is unknown whether this $32.000 claiming miler for fillies and mares will remain on grass. We will handicap it as it will stay on grass. Tammy’s Window drops to a realistic level, switches to Rosario, and has two prior wins over the local lawn. She has good tactical speed and should have every chance from a second flight, stalking position. Proud ‘n’ Ready, freshened since November, picks up Prat, and vans down following a healthy series of works at Golden Gate Fields for Sherman. She’s another with past success over the Santa Anita turf course and fits with these on her best day. Believe Indeed is slower on figs than the other main contenders but is a tough, veteran mare that has finished first or second in 18 of 37 career starts. She can at least get a piece of it with these. Forecast: This looks very much like a two-horse race and we’ll use both in our rolling exotics. Trapalanda crushed a bottom-rung field with a big figure last month and moves up a notch for new connections in this $8,000 seller. Bug boy Figueroa stays aboard for Lerner and should have this Slew’s Tiznow gelding on or near the lead throughout. Boy Howdy, first off the claim for Mulhall, gets Rosario and a comfortable outside post that insures an ideal pace-prompting trip. All three of his career wins have been accomplished over the Santa Anita main track. We’ll give slight preference on top to Trapalanda. Forecast: ​We’ll assume this race remains on turf. Rejeka was a solid runner-up in the Eddie Logan Stakes on Dec. 26 over this course and distance and a repeat of that effort in this first-level allowance event should be good enough. The Irish-bred colt switches to Prat, lands the rail, and looks tough to deny with the anticipated ground-saving trip. Neptune’s Storm stretches out after flashing excellent speed in a Hillside turf sprint and seems likely to be the controlling speed, assuming that’s the strategy they’ll employ. The gelded son of Stormy Atlantic broke his maiden over this course and distance during the fall meeting, but on pure numbers he’s slightly behind Rejeka. Both should be included in rolling exotic play. 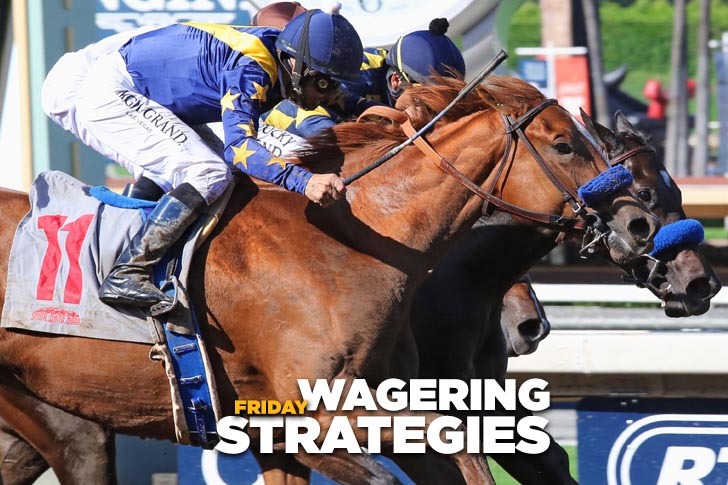 Forecast: Coil to Strike is improving with racing, continues to train well, and appears ready to graduate in this $50,000 maiden claiming sprint restricted to Cal-bred older horses. The Morey-trained gelding gets off the rail and should be on the pace throughout. Soul Owner has been away since April and returns in a logical spot for Belvoir. Numbers that he earned last year make him a fit if ready, but the work tab is light so he may be a race away. Preference on top goes to Coil on Strike but we’ll have tickets using both in our rolling exotics. Forecast: Dulce Ride has hit the board in her last four starts without winning, so she’s overdue. Second vs. similar company sprinting in late December, the daughter of Candy Ride stretches out again, and while winless two-turning she has run well enough to expect her normal honest effort today. Rosario stays aboard for Meah. Queen Bee to You always has preferred to run second or third rather than win and she’s zero-for-eight lifetime over the Santa Anita main track. However, she’s strong in the speed figure department, retains Bejarano, and should be used at least as a back-up or a saver. Forecast: ​True Validity and Queen of the Track finished two-three in a similar maiden-claiming main track miler here last month and clearly are the main contenders in a modest affair. ‘Validity has hit the board in her last pair and may not need much improvement to earn her diploma, while ‘Track does her best running on the front end and if she can clear without pressure she may prove to be an elusive target. In a race that we’ll otherwise pass, we’ll use both in our rolling exotics. Forecast: We’ll assume this turf miler for 3-year-old fillies will remain on grass. Lady Prancealot exits a series of much tougher stakes races and should greatly appreciate the class relief. She didn’t get the clearest of runs when fourth as the favorite in the Blue Norther Stakes in late December but with a trouble-free trip today under Rosario should be capable of producing the last run. Cavernndchipmunks is an intriguing Euro-invader from the D’Amato barn. She makes her U.S. debut with Lasix and Prat, and her overseas juvenile form in the French provinces was excellent. We should be able to get by using just these two. Forecast: On anything close to his best day, Solomini completely outclasses this field. He was non-competitive when ninth in the opening day Malibu Stakes in his first start since last summer but this first-level allowance field is infinitely softer so he really shouldn’t miss. But at a short price, he’s not what you’d call trustworthy. For protection, you can include Kylemore on a ticket or two. The Baltas-trained gelding earned a career top speed figure when second at this level last month, so if repeats that type effort today he should be in the thick of it. Forecast: As this is written, it is uncertain if this race will remain on grass. Because it was scheduled for the Hillside Course, we’re going to assume that it will be taken off the turf. Best advice is to use as many as you can afford to. Short of Ez is comfortably drawn outside and has a strong dirt number to go back to. He should have every chance from a good stalking spot. Bucky’s Pick ran reasonably well over this main track during the fall meeting when finishing third in a starter’s allowance and a similar effort today puts him in the hunt. Sword Fighter is a first-off-the-claim for Glatt and clearly prefers dirt, so he’ll benefit if the switch is made. He has only one strategy from the rail, gun for the lead and hope to hang on. Cat’s Blame has never won on dirt but has some okay prior main track races that chart well here, so we’ll toss him in as well.